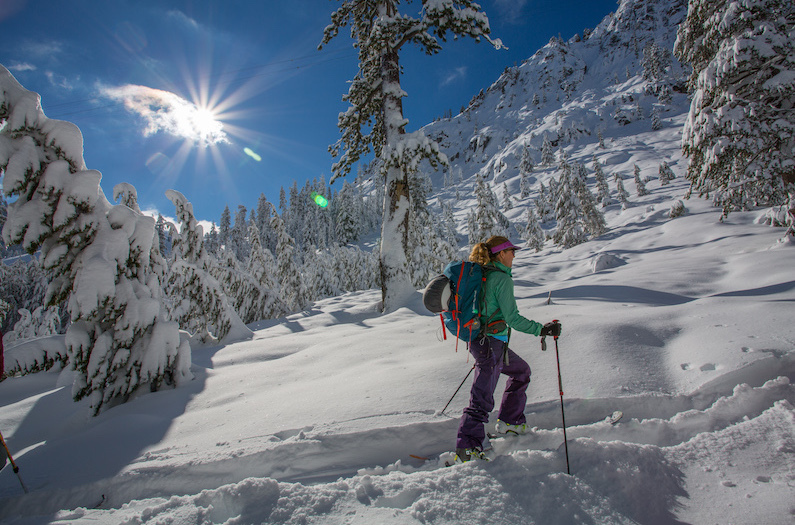 Learn the fundamentals of traveling safely and efficiently in the backcountry. 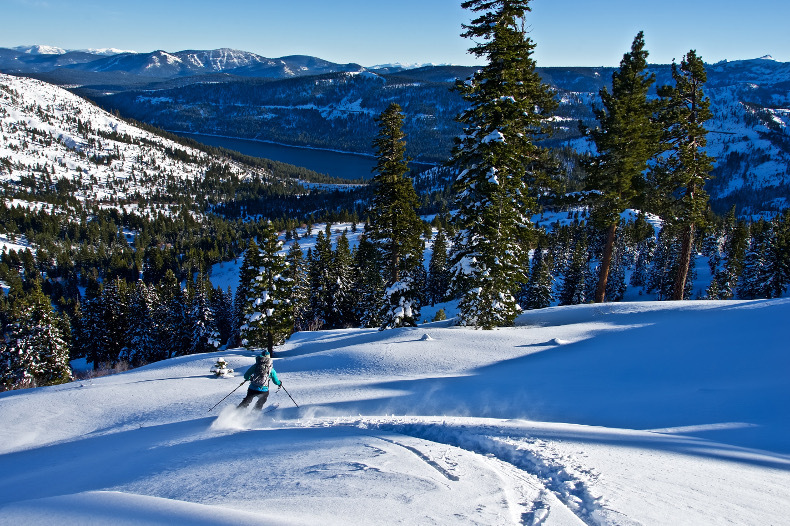 This trip prepares you for an intermediate Lake Tahoe Ski Tour. Please note, this course is not for beginner resort skiers/riders. 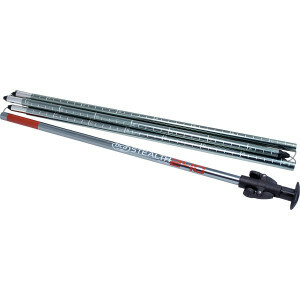 You should be an advanced resort skier/rider before pursuing backcountry skiing/riding. Please contact the office if you have questions about skill requirements. 877-873-5376. 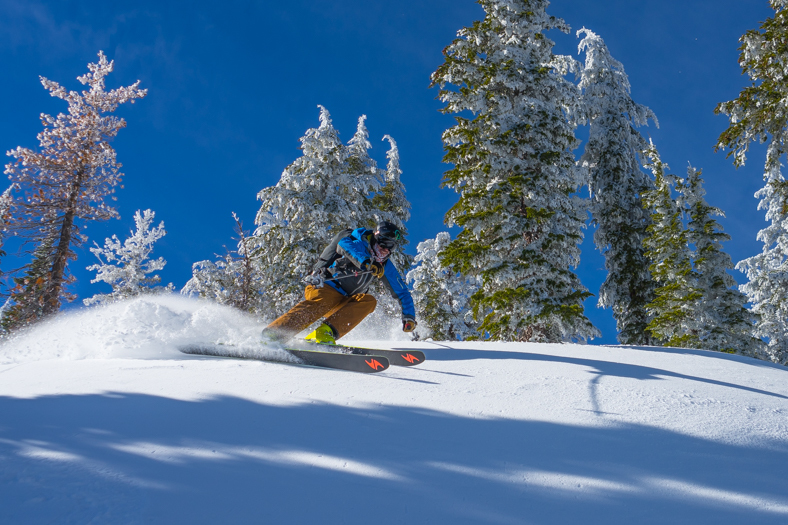 Both skiers and splitboarders are welcome in this course. 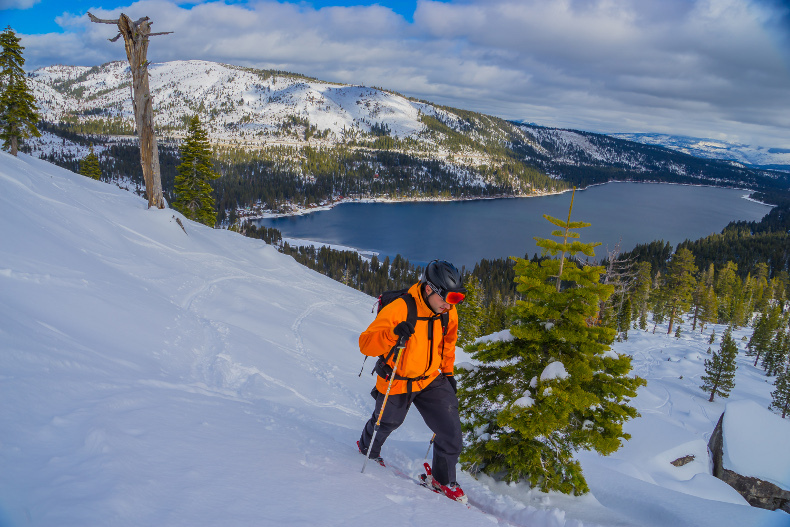 This one day course will introduce you to the fundamentals of backcountry skiing and snowboarding. 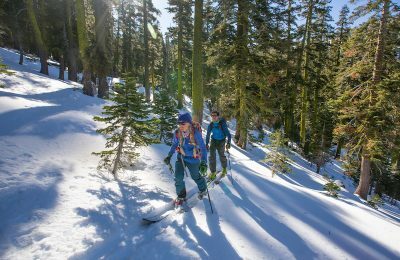 After this course, you will be able to plan and execute an efficient, simple backcountry ski tour. 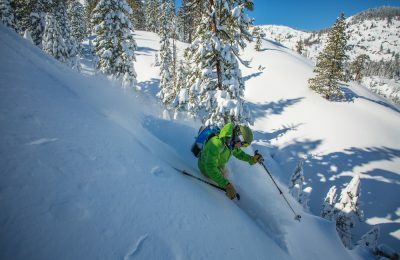 Come out and learn the techniques and tricks from a professional ski guide, and get away from the lifts and the crowds of the ski area. 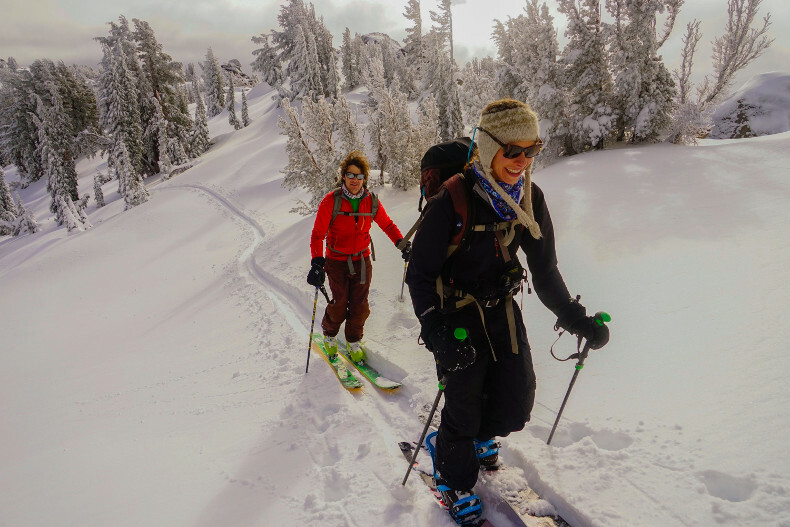 Our Introduction to Backcountry Skiing is a great prerequisite for an AIARE 1 avalanche course. Field sessions take place in Shirley Canyon, located within Olympic Valley. 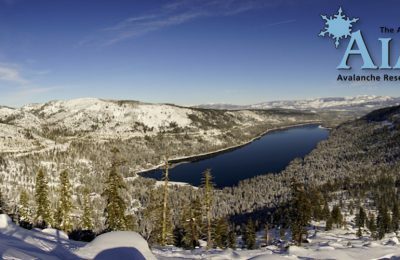 Alpenglow operates in partnership with The Tahoe National Forest and Squaw Valley | Alpine Meadows. 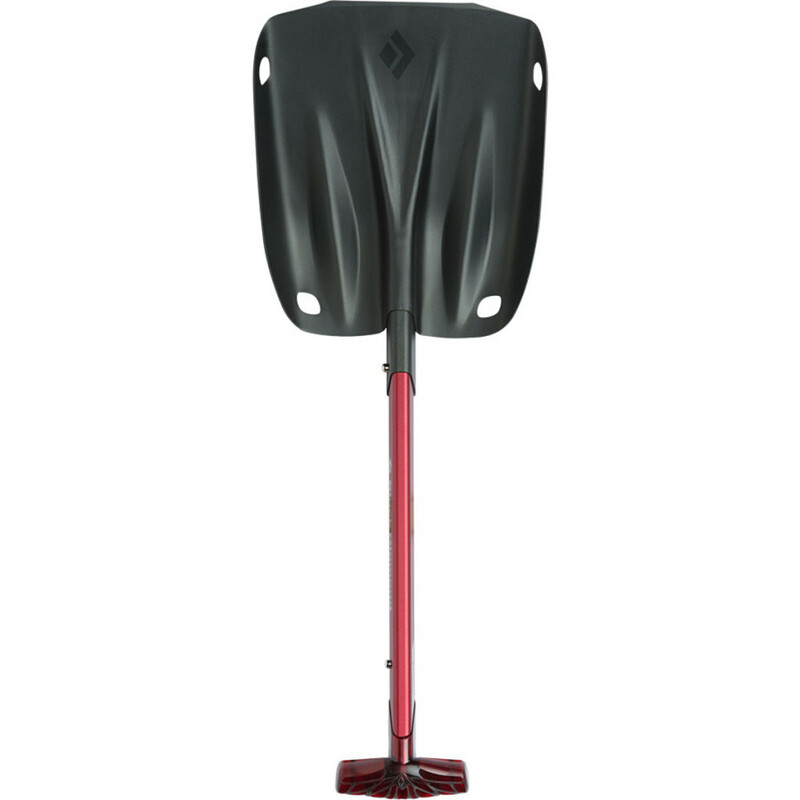 Difficulty: Strong intermediate to advanced skiing level required. 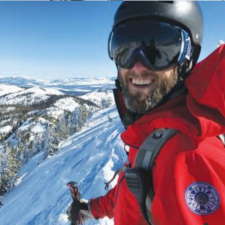 Meet your guide and fellow skiers. Set goals for the day. 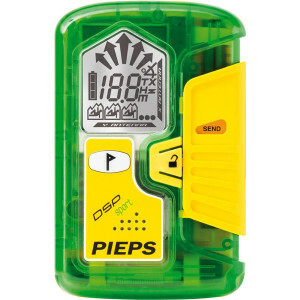 After reviewing gear and equipment, head out for the first climb and descent of the day. In between the morning and afternoon sessions we'll take a break for some much needed calories. Depending on our observations from the morning we'll spend the afternoon skiing and may work in a mock avalanche rescue. Yes. 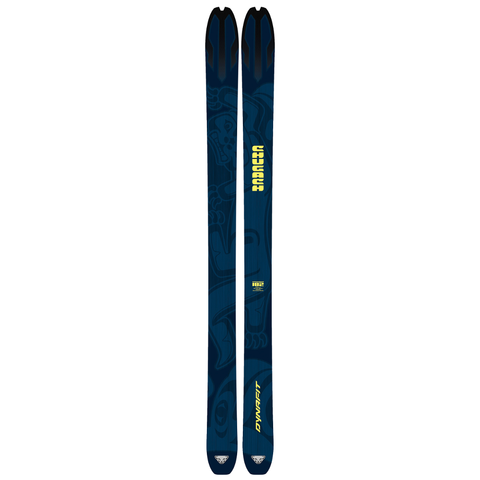 All-new 2017 Blizzard Skis, Tecnica Boots and Jones Splitboards are available for rent for $55 per day. We also rent beacons, shovels and probes. What level skier or snowboarder do I need to be to take this course? You need to be an advanced-intermediate skier or snowboarder within a ski resort. Do I have enough experience for this trip? 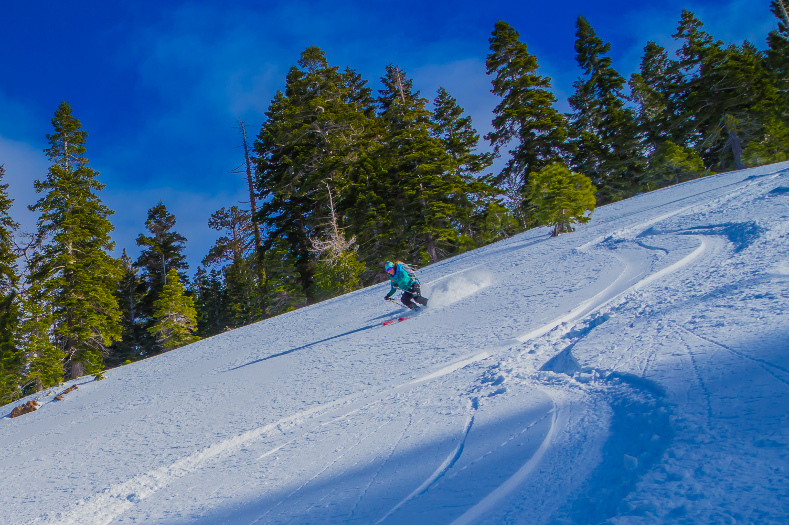 You must be a strong intermediate skier or rider to join us in the backcountry. This is for the safety and enjoyment of everyone. 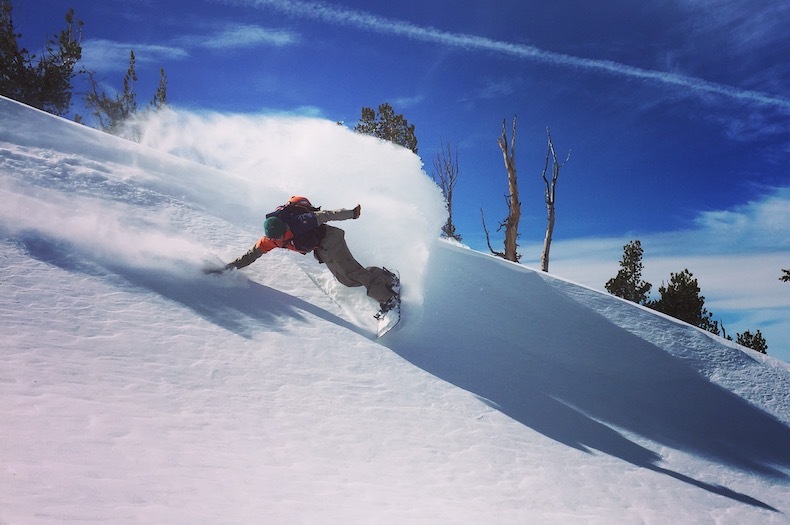 Other than these skills, you do not have to have any other experience in the backcountry. 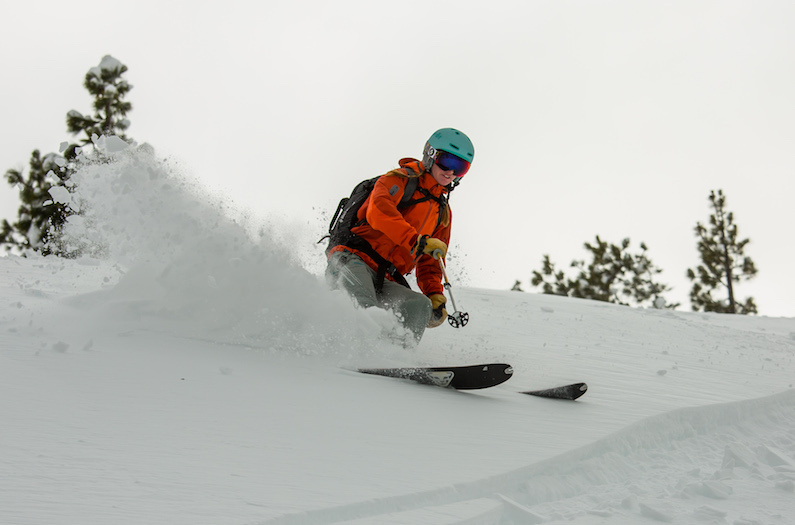 This course is designed to take the resort skier beyond the boundaries, and show them the world of backcountry skiing. While every day varies slightly, on average we skin (hike with skis) between 1,500’ and 2,500’ of vertical gain. Lunch is not included, we recommend bringing a sack lunch and plenty of water. There are also plenty of food options around our office in the village. Alpenglow takes pride in our small group sizes, and while they vary in size, the maximum ratio is a 4:1 clients to guide. What safety standards do you have for this trip? 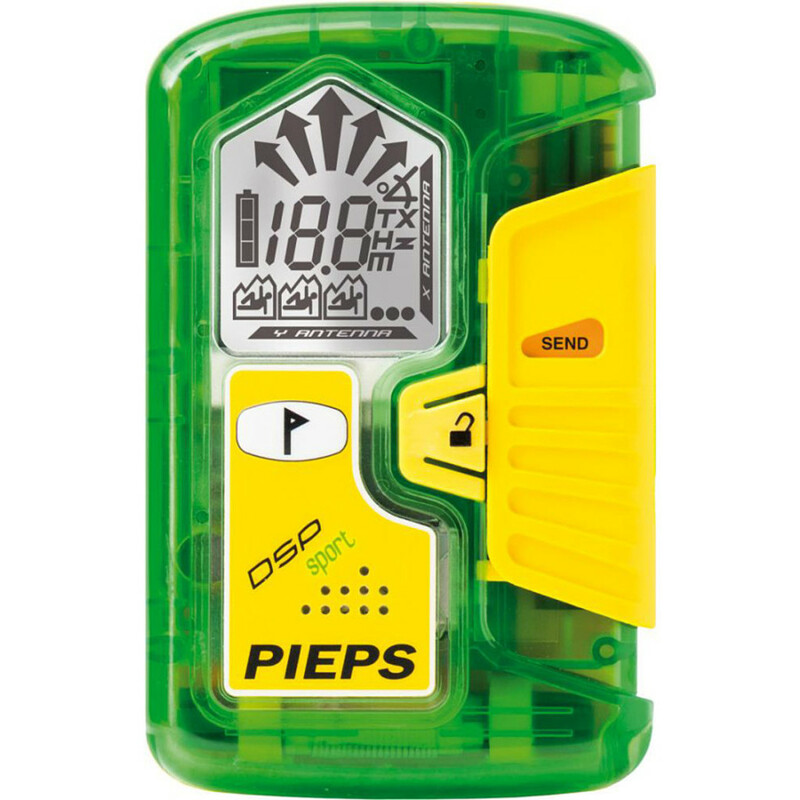 At Alpenglow, we have only the highest standards of safety and guide qualifications. 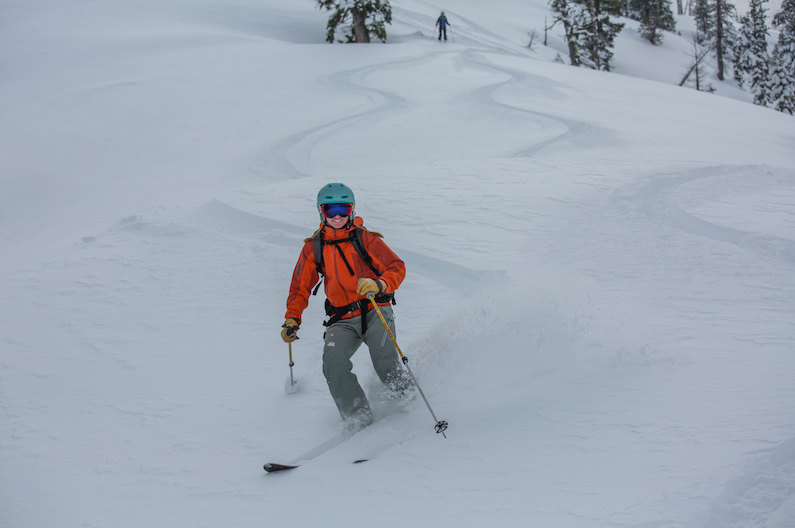 All of our local backcountry tours are led by AMGA trained/certified guides. Our guides assess the snow conditions and avalanche hazards every morning to mitigate risk, and are supervised by fully certified IFMGA guides. 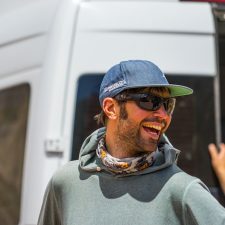 Chris grew up in Pennsylvania’s Pocono Mountains before moving to Oregon and becoming a guide in 2006, and has been climbing and skiing across the globe ever since. 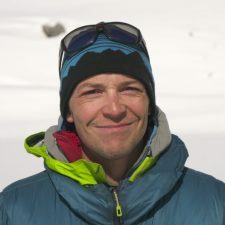 He is a fully certified IFMGA Mountain Guide, and can regularly be found at work from the French Alps to the Canadian Rockies and Norway’s Lofoten Islands. 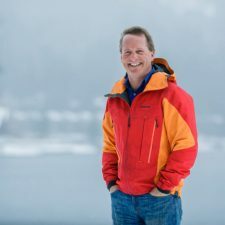 His achievements include everything from big walls to virgin summits, first ski descents and traverses, and his guiding career has taken him from the Matterhorn to Denali, and from Mt. Hood to Mont Blanc. 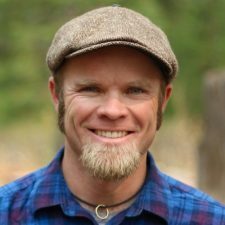 An avid alpinist and expedition climber, Chris has received the prestigious Mugs Stump and Lyman Spitzer Cutting Edge Awards for his ascents of hard new routes on unclimbed peaks in the Nepali and Indian Himalayas, as well as the rest of the world, including the famed East Face of Alaska’s Mooses Tooth. He is easily excited by rocks, snow and ice, and by travel, coffee, beer and greasy food of any sort. 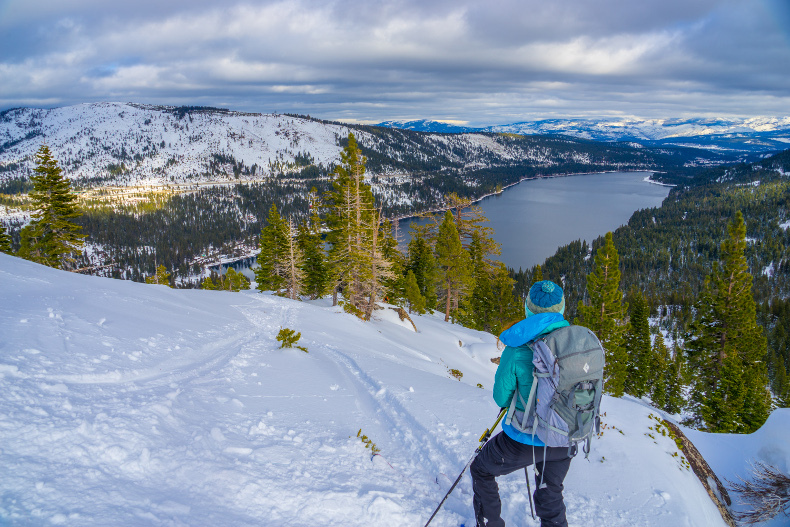 Being new to backcountry skiing in Lake Tahoe, I wanted to learn as quickly as possible by hiring a guide. I settled on Alpenglow Expeditions and never looked back. The office staff were very professional prior to my trip, and my guide Tim Dobbins was one of the most knowledgable skiers I've ever skied with. Why take an Intro to Backcountry Skiing course?